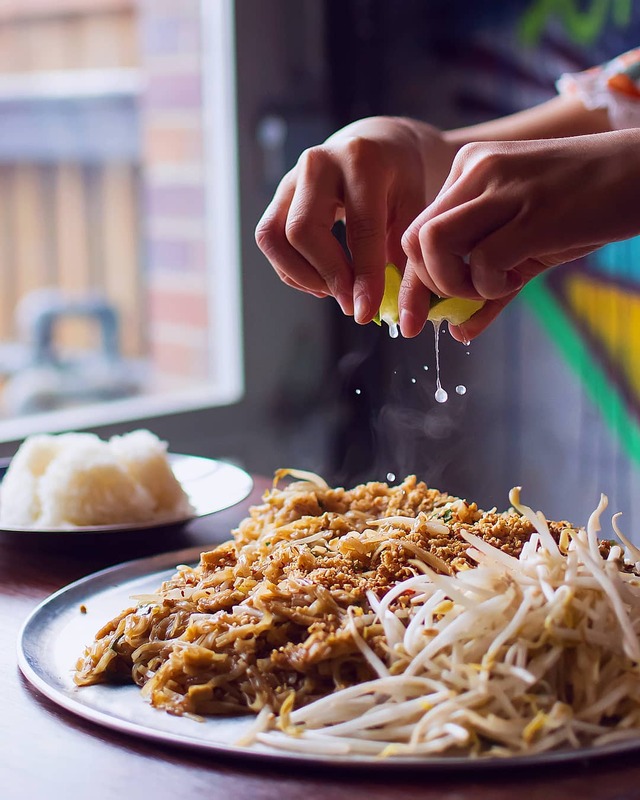 The ingredients of Pad Thai include fried noodles mixed with eggs, peanuts, dried shrimp, tofu, tamarind, beans, sometimes with shrimp or squid. The partial Pad Thai is priced around 70 to 80 baht. You can find Pad Thai in almost every Thai restaurant in Bangkok. Pad Thai Ekamai is quite small but serves the best Pad Thai in Bangkok, especially fresh seafood fried with noodles. A serving in Pad Thai Ekamai is a bit more expensive than other stores for 250 baht, but the dish is very hearty with fresh squid, two large king prawns, and a few pieces of fresh meat. There are other options for diners such as a basic Thai dish of fried pork with chilli at about 45 baht. 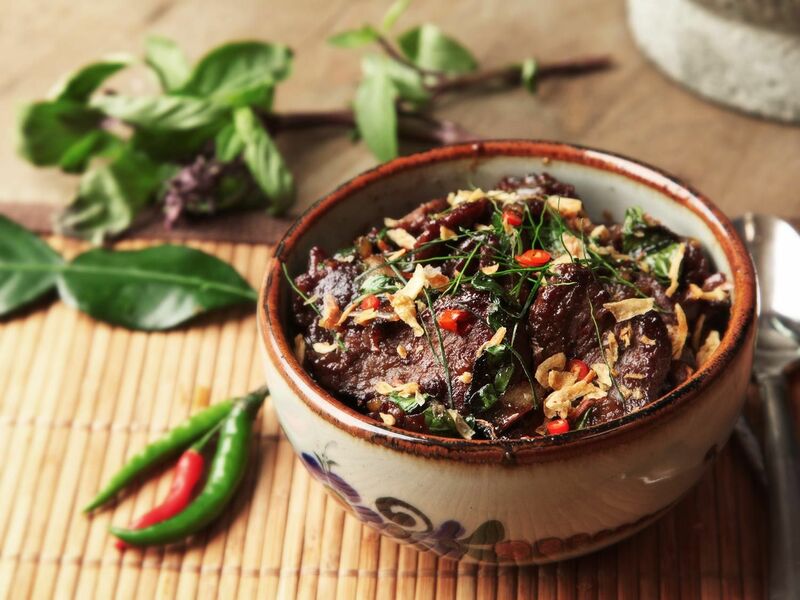 It is considered to be full of the basic taste of Thai cuisine: the sourness of the lemon, the spicy of chili, the salty taste of fish sauce and the sweetness of palm sugar. 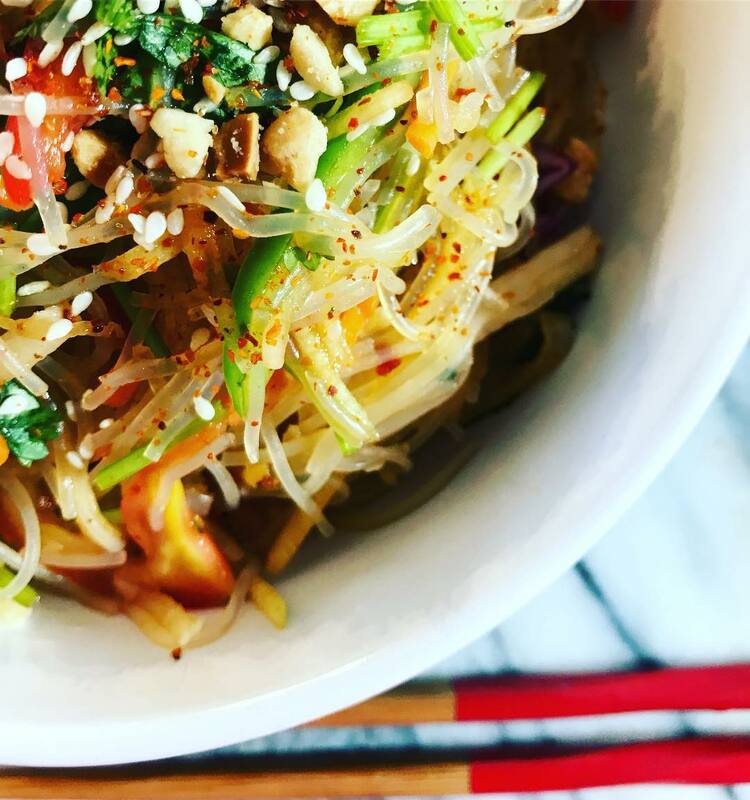 Traditionally, a Thai papaya salad consists of shredded papaya, cowpea, sliced cucumber, dried Thai chili, Thai basil, lime juice and roasted peanuts, chili, and garlic. You can enjoy this dish all over the streets of Bangkok, but Som Tam Nua in Siam Square Soi 5 is one of Bistro style restaurants has Som Tum as the best Bangkok food. Depending on the time of day, you will enjoy different dishes. One thing for sure is that this place is never empty so you have to wait a long time to be served. There are four types of papaya salad but ‘Som Tam Thai’ (75 baht) is mixed with lots of lemon and chili. From the first bite to fresh papaya and crispy peanuts, you will feel the characteristic sour and spicy taste. Then, the tomato pieces will soothe your taste buds. Tom Yum is the name of a kind of Thai hot and sour soup that has become one of the best Bangkok food all over the world. It is made from the freshest shrimp with Thai spices and herbs which have the spicy and sour taste. For the soup’s thickness and aromaticness, Thai people often add coconut milk to soup. In addition, Thai people also sprinkle fresh cilantro over Tom yum. This will enhance the taste and balance of color. 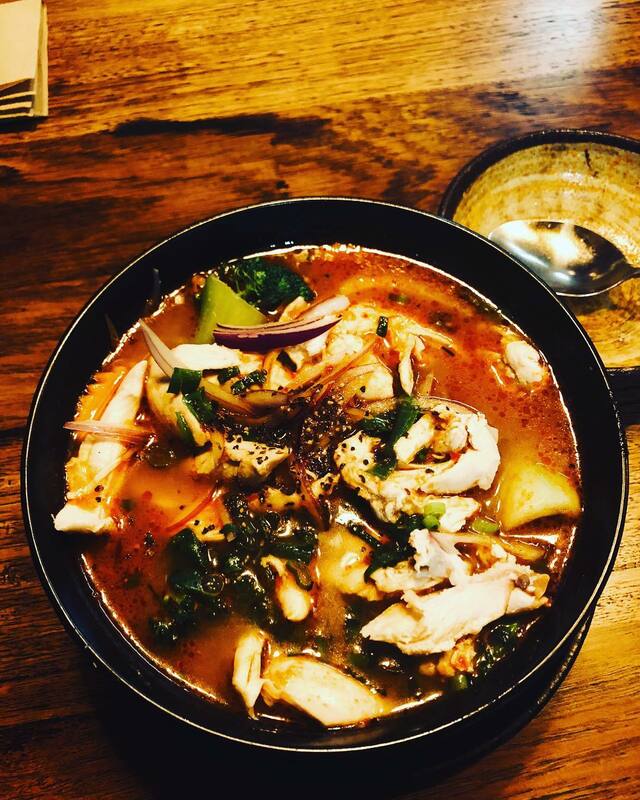 Tom Yum is best served when it’s still hot. T & K Seafood in Chinatown is highly recommended for the one of the best Tom Yum in Thailand. The restaurant is usually crowded with travelers and locals but the food is served quite quickly. 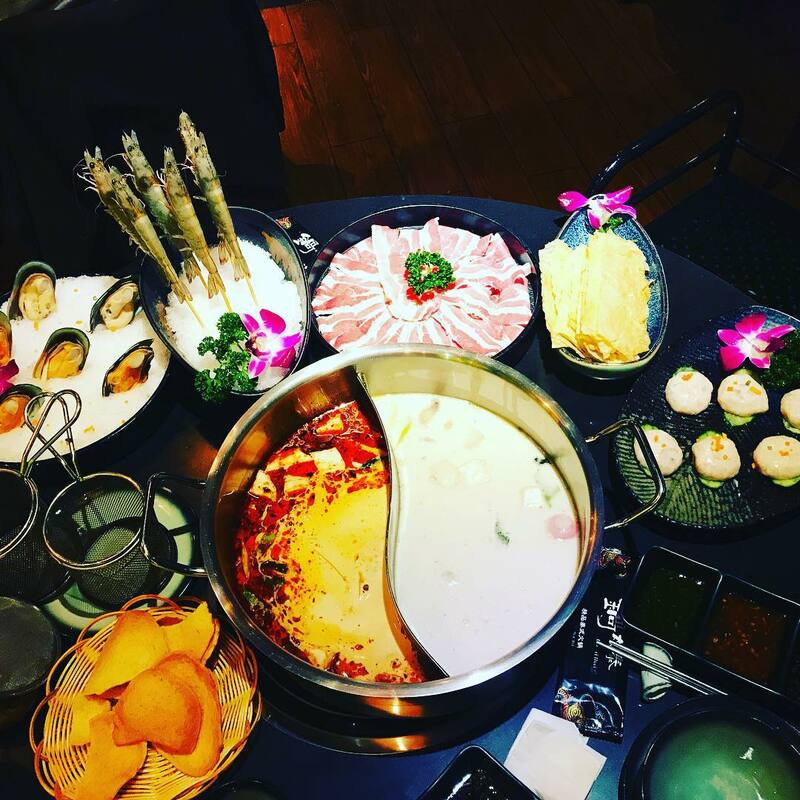 You will leave with a very happy tummy after trying the perfect combination of spice and exotic ingredients in its Tom Yum. Red curry is an extremely spicy dish, usually cooked with fillets of chicken fillet and a little creamy red curry, crushed peanut sauce and of course a lot of peppers. 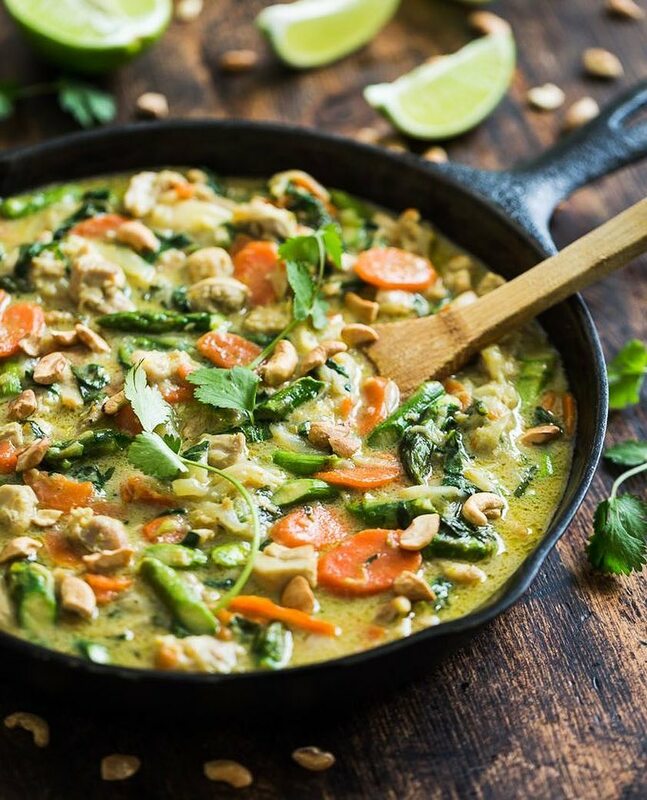 Green curries can be made with all types of meat, but the most common are beef, pork, chicken, and fish. This dish is usually served with rice or with Khanom chin (rounded rice noodles). You can try Thai curry in the Sriyan market or Ratchawat market. The roasted rice must ensure that the rice is not too crushed or, each grain must be intact and spiced. The chef also covers this dish with a layer of omelet. A chicken or pork roasted rice will cost about 40 baht, fried rice with seafood is more expensive with about 50 baht/dish. Pla kaow yaang bai hua la pa is grilled fish wrapped in basil leaves. The grouper is a saltwater fish, which is almost universally preferred in fish because of its white, tough and sweet texture. Groupers are cooked into many delicious dishes such as Steamed salted grouper, Streamed grouper with soy sauce… But to keep the full flavor of the ocean, grouper must be lightly baked and cooked to medium enough to retain the original taste of the fish. You can easily find these dishes at the stalls on the streets or floating markets, as well as the famous restaurants. 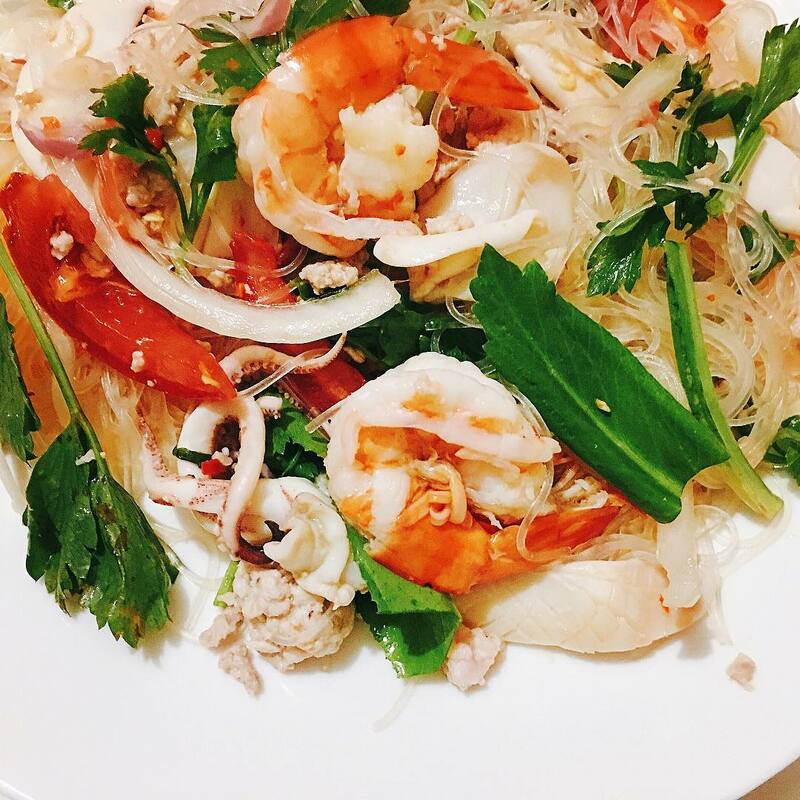 Talay Woon Sen is used as an appetizer and often appears in family meals of Thai families. Traditionally, it is also the dish used in royal meals. 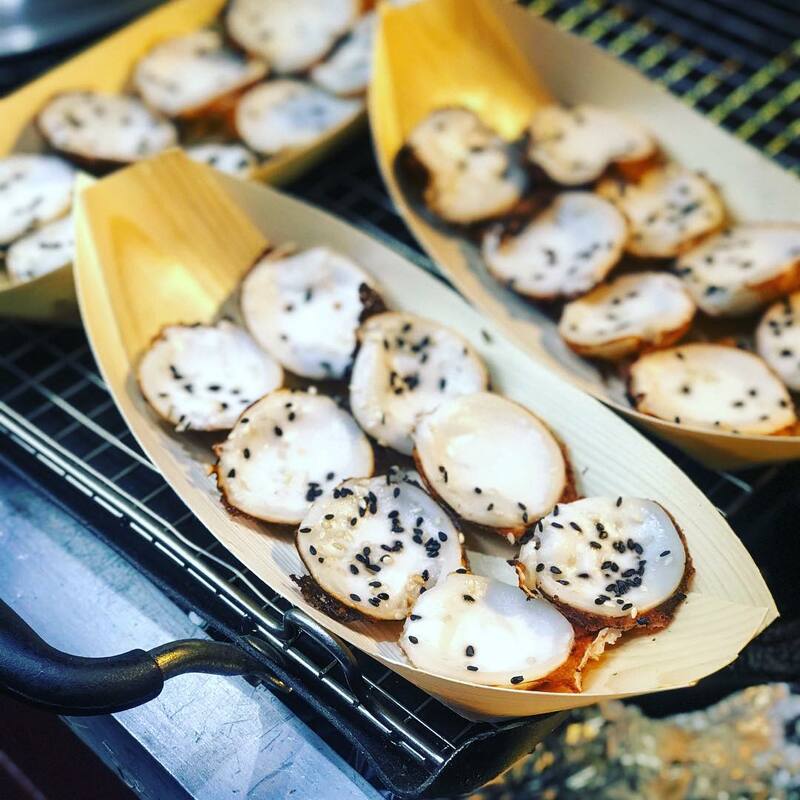 Talay Woon Sen is simple and easy to make, very tasty so this dish has been imported throughout the country and integrated into the world’s food. This is one of the most popular street food in Thailand. 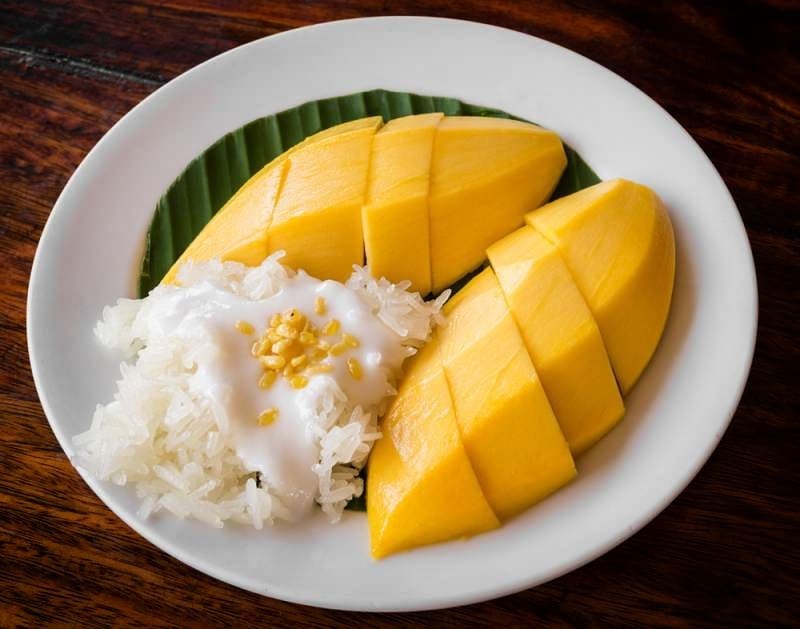 Thai people eat mango sticky rice as a dessert. 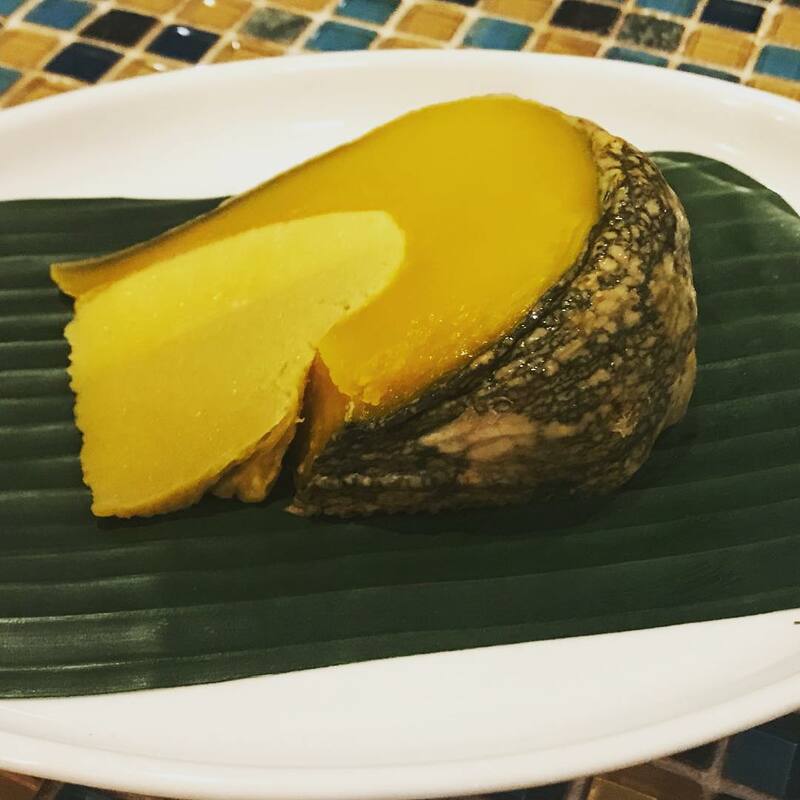 The mild sourness of mango will help to neutralize the sweetness and fatness of coconut milk, creating an unforgettable taste for this dish. The cook has to go through many steps: The rice must be soaked overnight before cooking. When it is half cooked, the cook must mix coconut milk and sugar and then steamed back. Once cooked, sticky rice is presented on a plate, added a layer of mango, coconut milk, and toasted sesame seeds. 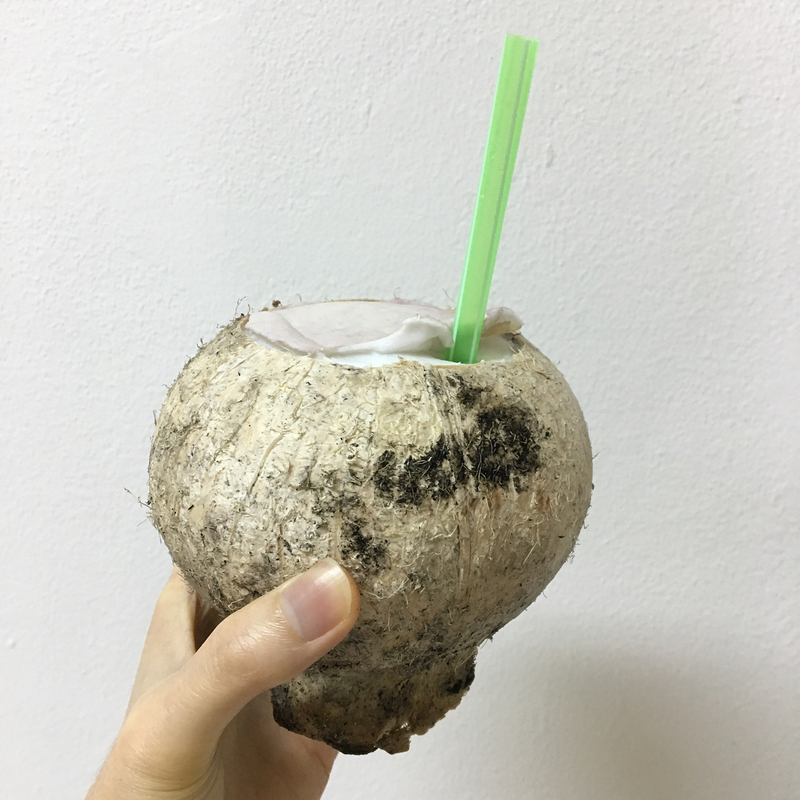 The process of this dish is very simple: Roast the coconut on the fire so that the coconut water becomes sweet and fragrant. The price for a roasted coconut is about 2 USD. This dish is made from flour and coconut milk mixed in a certain proportion and then baked on charcoal. Once cooked, a sprinkle of shallots will be sprinkled on top of the cakes to increase the aroma and reduce the sweetness of the coconut milk. 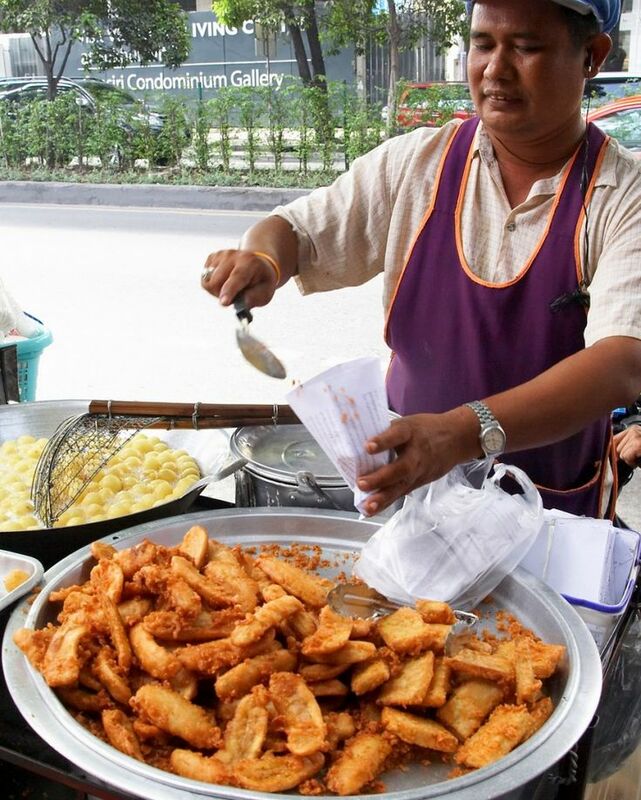 Fried Banana is also a popular snack of Thai cuisine. The banana used to make the dish will be thinly sliced and dipped in a mixture of coconut milk, flour, sugar, salt, coconut then fried to be crispy and golden brown. Thai pumpkin custard is quite easy to make. The sellers will simply mix the palm sugar shavings with coconut milk, eggs, salt, and vanilla to make the custard. Then they cut the top off of the kabocha squash, pour the custard mixture inside, and steam the entire pumpkin filled with custard. When the custard sets inside the pumpkin, the pumpkin itself will be perfectly cooked. Coconut cream is made from coconut milk, so it has a very smooth and greasy texture. This dish also has fresh copra, peanuts, or some dried fruits of your choice. 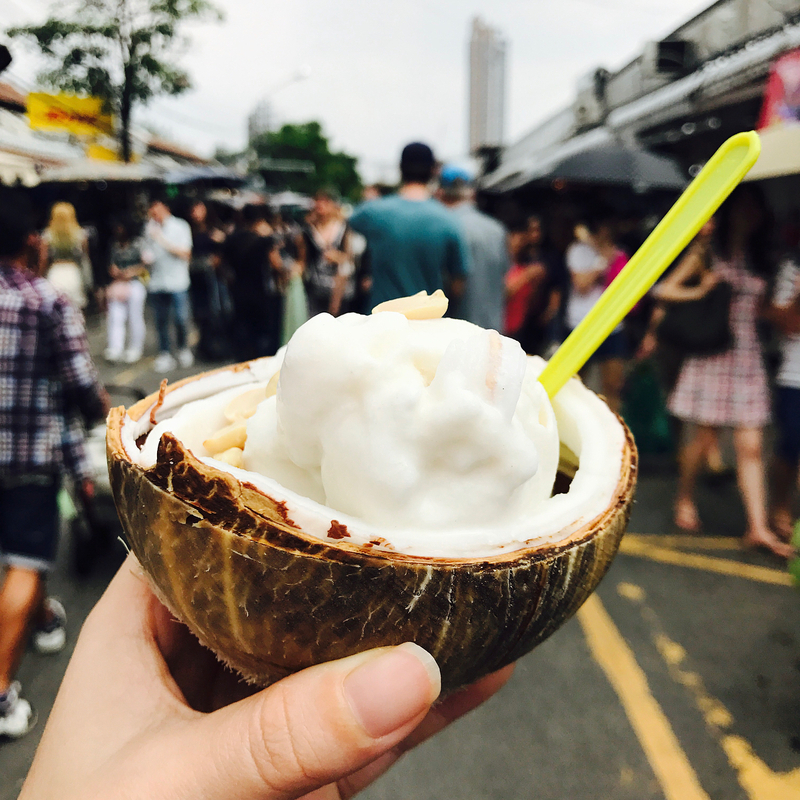 The seller will quickly hand over two coconuts, drain coconut juice and use half of the coconut as a cup of ice cream. This dish can be easily found in Bangkok night markets. Wonder which night markets to go for? 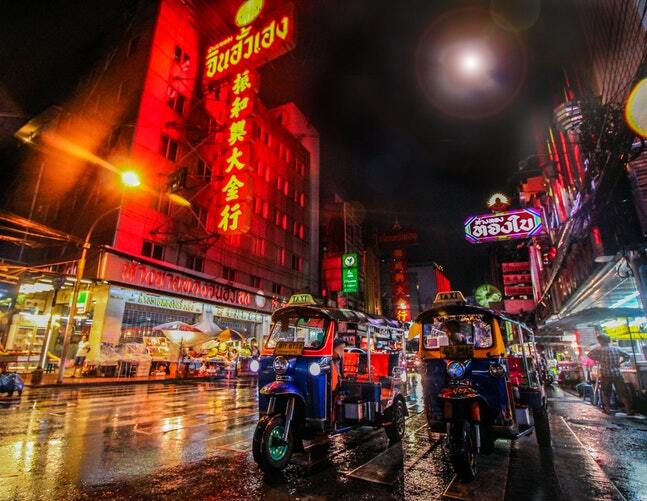 Check out our guide on 16 Bangkok night markets you should not miss! Soft boiled eggs in Thailand are normally available at street food stalls, convenience store and restaurants that specialize in breakfast and that serve tea and coffee. Boiled eggs are seasoned with soya sauce, pepper and it also goes extremely well with the Patong donuts. 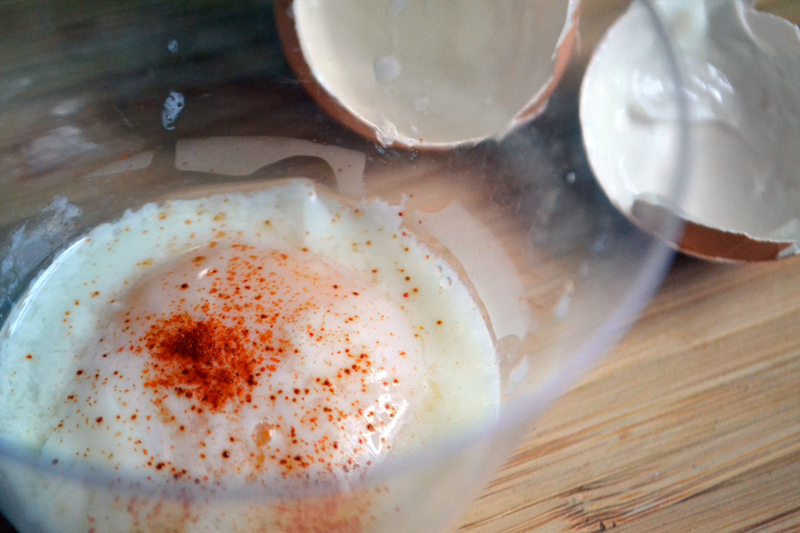 It’s an amazing, quick, and delicious source of protein start a new day. It’s not an exaggeration to say, when it comes to Bangkok, the food scene is among the best in the world. When it comes to neighborhood eating coves, vendors or carts gather in groups, dining small restaurants and roadside stalls, there are few places that can compete with the city of angels. 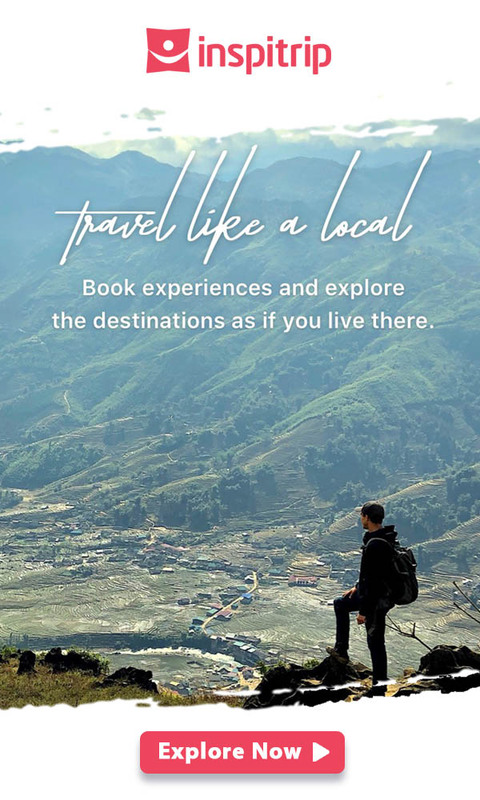 I’m an American living in Bangkok and just like America there are many foods I don’t like I’m also partial Certain foods in Bangkok I notice just like in Mexico some Water you have to be careful.